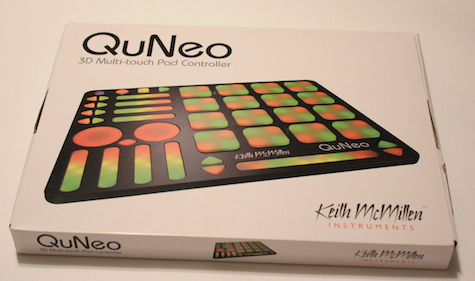 The Keith McMillen QuNeo is a pad based controller designed for music or video creation and performance applications. The QuNeo shows input response through 251 multicolor, programmable LEDs. It communicates MIDI via USB through: 16 Pads with velocity, pressure, and x/y sensitivity; 8 pressure-sensitive touch slider; 1 long pressure-sensitive multi-touch slider; 2 pressure-sensitive rotary encoders; and 17 pressure-sensitive buttons. In short, the QuNeo is a monster of a machine. 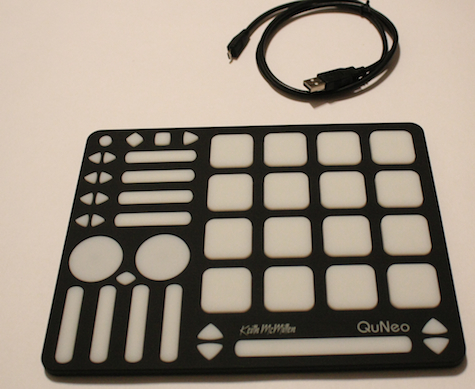 The QuNeo is about the same size as an iPad, although much lighter in weight. It is housed in a matte black plastic case. This is high quality plastic; it feels solid in your hands. There is almost no flexing and none of the creaking you find in cheaper made plastic products. This controller was built to take some abuse, which you can see the company demonstrate in its stress test video. The only port is a micro-USB on the left side. The case is held together externally by five screws on the bottom. This company has a design and manufacturing combination that has taken cues from the design philosophy of Apple and expertly applied them to their device without seeming derivative. According to the company, the QuNeo works with over 30 applications right out of the box. I didn’t have access to all of them but I will discuss the few that I did have accessible. On the software side first there is the QuNeo Installer which sets up the device for your computer and will also configure a set of certain applications, such as Abelton Live, Logic, and Mixxx, to name a few to work with the QuNeo. The installer also installs the QuNeo Editor as well as preset template files to use. The QuNeo Editor is where you can customize the mappings for the QuNeo. You can edit the factory supplied templates, as well as restore them if you need to, create your own templates, export your templates to share, and import templates to your own device. You can also edit the mappings through the device’s CoMA mode which is a quick edit mode to use while you are using the QuNeo with an application. Right out the box the QuNeo is a breeze to setup. I spent more time finding my iPad camera connection adapter to use it with my iPad than I did installing the software and updating the firmware. It is recommended to update the firmware before you start using the device. One of the presets that comes with the QuNeo is for the Roland iMS-20, a synth app for the iPad. To set up for use, you select the iMS-20 preset which is a simple two button process, plug the QuNeo into your iPad, then start the app. The QuNeo will light up as the app starts to let you know that it is connected and recognized and you are good to go. When connecting to your iPad, unless you have purchased the remote power kit, put the device in iPad mode which will reduce the brightness on those 251 LEDs you are now powering through your iPad. When using the QuNeo with the iMS-20 app I didn’t like how the x/y sensors were mapped to the pitch of the oscillators — a short time in the QuNeo Editor application and I was able to turn them off and get back to using it. Setting up your own template is extremely easy. I decided to see if I could map the device so that I could use Abelton Live in a “DJ” setup. Using the MIDI mapping within Abelton I was able to get a rough configuration that I was happy with in about an hour, and I was fully up and running in two hours. I was able to find online a template for another iPad app, Akai’s iMPC. Importing into the editor application and setting it to one of the presets was a breeze. The iMPC recognized all of the inputs flawlessly, even though this was a template made by a third party and not by Keith McMillen or Akai. Playing the QuNeo is a dream, and the responsiveness is incredible for a device at its price point. I can get great, subtle were the rotary controls and I think those just need a sensitivity tweak from the editor application. The worst thing about the QuNeo is the best thing about it — it is a blank canvas. You can use the presets but the power of the QuNeo comes alive when you find the best way to use the device. You can essentially create your own instrument and there isn’t a wrong way to play. You are creating the best way to express what you want. With an almost innumerable amount of configurations, the only limitations are your own. MyMac Review Rating is 9 out 10.